Did you think that the Ghettocharged FrankenMiata, Faster Farms Chickenmobile, pair of X1/9s, and other awesomeness meant that the upcoming 24 Hours Of LeMons Arse-Freeze-A-Palooza couldn't possibly get any better? Wrong! 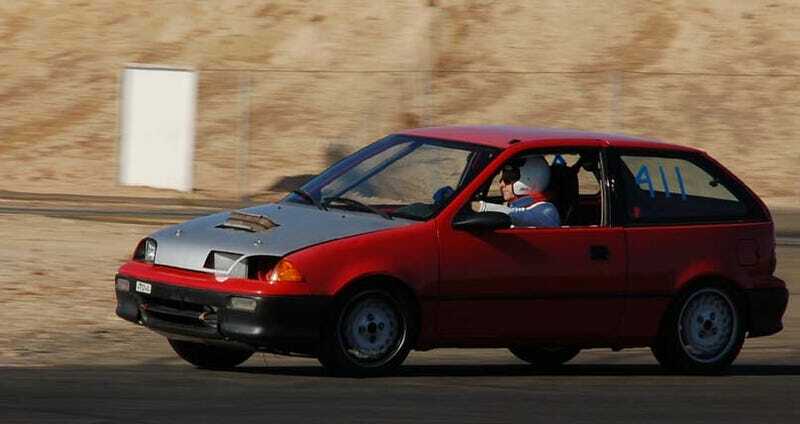 We've just received a few photos of the Team Metro-Gnome Geo Metro, which is powered by- hallelujah!- a Hayabusa CBR900RR engine! It's a front-wheel-drive setup, chain-driving the original Suzuki transaxle differential… and, yes, that is a toilet plunger being used as a grease seal. Make the jump to get the story from team member Alex.